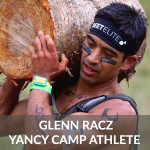 Premier OCR Athlete Glenn Racz - Yancy Camp - Fitness for Everyone! One of the top runners on the race circuit who also has an American Ninja Warrior background. Glenn is a well rounded hybrid athlete and is proving to be a top podium threat in every race he enters. You can spot Glenn competing at Spartan (Sprint, Stadium Sprint, Super, & Beast distances), BattleFrog, OCRWC, and various other races. Glenn will also compete in a trail/road races, has a 5k PR of 14:57, road mile PR of 4:14, and has competed in American Ninja Warrior. Glenn will be adding Toughest Mudder races to his schedule in 2017 and with the level of training we're accomplishing, I'm confident he'll be one of the top guys to look for in the overall and team standings. 2016 Season: 10th place finish at Spartan World Championships and numerous podium finishes. 2015 Season: 8th place finish in the Spartan Elite Points Series, numerous podium finishes. Glenn is a mechanical engineer, married, and the father of three kids. He's also one of the most down to earth genuine guys you'll ever meet! Glenn is excited to partner and train with clients from all over the world who are ready to join his #YancyCamp Training Program. *Contact Glenn for great discounts from all sponsors.